This time five years ago I started work on my third book Fabric Manipulation which was published a year or so later. It gives me real pleasure to see these exciting techniques being enjoyed and re-invented. It is always a pleasure to go back through my boxes of samples from the book and share them anew. Last week’s students at West Dean College produced some amazing pieces, variations and interpretations of the techniques. Shibori work is by Romor Designs. I hope this course will be repeated at West Dean in a couple of years. In the meantime I have a smocking workshop in London in June and a couple of dates of manipulation techniques with Gillian Cooper Studio in Scotland in August. Next year I hope to launch some online courses exploring manipulation techniques in more detail. There are lots of links and resources on the Fabric Manipulation page too including extensive Pinterest boards and blog posts. A trapunto wall panel project I designed for Today’s Quilter is now published in Issue Twenty. Trapunto or stuffed / corded quilting is semi-forgotten technique these days and it’s my mission to bring it back to life with new contemporary designs. I have been researching and practicing trapunto for about 10 years, inspired by the oldest surviving example, the 14th century Tristan Quilt in the V&A. It was popular in the 17th century and had a brief resurgence between the wars in the UK although it has a more continuous tradition in France where it is called Boutis. I love trees – both naturalistic and stylised versions and a branch makes a design for a sampler where you can try cording and lots of stuffed variations. My love of trapunto continues unabated and I am always looking out for interesting pieces in museum collections and antique textile sales. It’s been a delight to be asked to produce designs for books and magazines (another one due out this autumn) and to teach this technique as much as possible. I am teaching trapunto this year in various places including one hour tasters at the Festival of Quilts and a full weekend intensive stitching (details TBC) in October. My short history of trapunto is here. I am working on a short online course for beginners trapunto too which will be available later in the year. I’m teaching a Fabric Manipulation long weekend workshop at West Dean College 16-19 March 2017. If you love texture and structure in textiles this is a perfect course for you to get really absorbed into exciting techniques and develop your own style with three days of teaching with loads of studio time and inspiration. Over the weekend you will have chance to try out a wide range of fabric manipulation techniques, taking inspiration from historic textiles and contemporary fashion. Techniques include formal and organic pleating and folding, stitching and gathering to create interesting textures and 3D appliqué to create bold, exciting fabrics from scratch. You can make samples or work towards a finished textile piece. Fabric manipulation techniques can be combined with embroidery and quilting to make really unique and exciting projects, or learn skills to add into fashion and dressmaking. West Dean is a spectacularly lovely place to study (and indeed teach) which makes it a perfect place to recharge, learn new things and absorb inspiration. The workshop starts on Thursday evening with dinner with the students and tutor, followed by three intensive but relaxed days of tuition. Students can choose a full-board residential option and stay on site and have access to studios in the evenings, with all meals and equipment provided. You will need to bring some of your own materials to get the best of this course but there is nothing expensive required. I’ll be returning to West Dean in the summer to teach Stitched Textiles from Historical Inspiration. 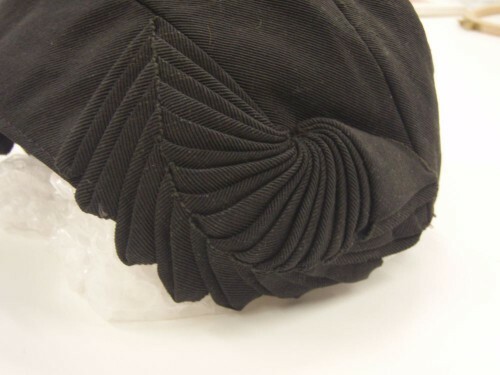 In my research into manipulated fabrics, I have often come across trimmings created using pleated or gathered ribbon, most often on hats, although sometimes on garments too. 18th century dress trimmings are usually made from self-fabric (strips of the same fabric the garment is made from) rather than ribbons. Box pleating is common, as are bias-cut ruffles. 18th century box pleats started a journey of discovery for me when I started working in textile, investigating and experimenting with techniques to create contemporary work inspired by these old folds. Antique ribbons can be pretty special items in themselves, but when they are used to create interesting decorations and trimmings, ribbons become something even more amazing. Ribbons have been used for hundreds of years to decorate hats, dresses and accessories. Corsage by Ruth Singer using vintage ribbon and 1920s techniques. 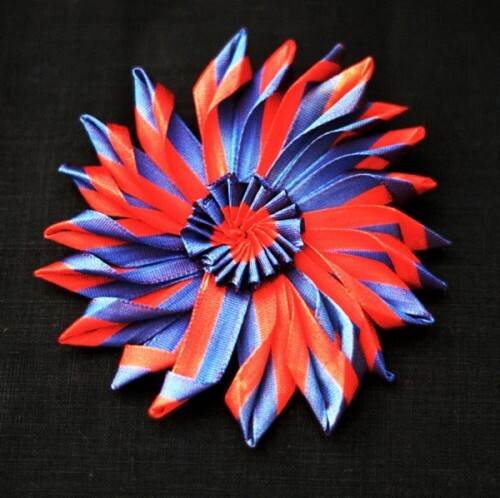 Beautiful ribbons were woven in Coventry (as well as other places) from the 1700s which were pleated, gathered and arranged to make stunning hat decorations, taking a bonnet from basic to beautiful. 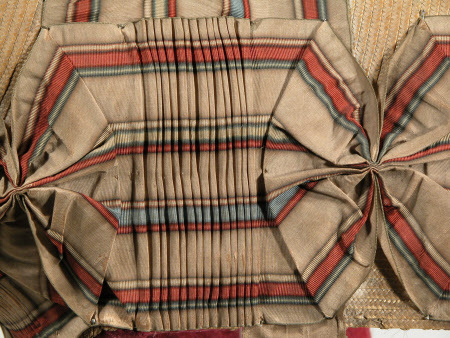 Extra-wide ribbons were made specifically for trimming dresses and millinery and their designs could easily be enhanced by the methods of folding and stitching used, as shown in this example where the stripes are manipulated to create decorative effects. I recently came across illustrations via Pinterest from a German women’s magazine called Der Bazar dated 1871 on Google books which shows several fantastic pleated ribbon trims which I am keen to try out myself, and you can often spot folded and manipulated ribbon trims on original garments and in fashion plate illustrations in the later 19th century. 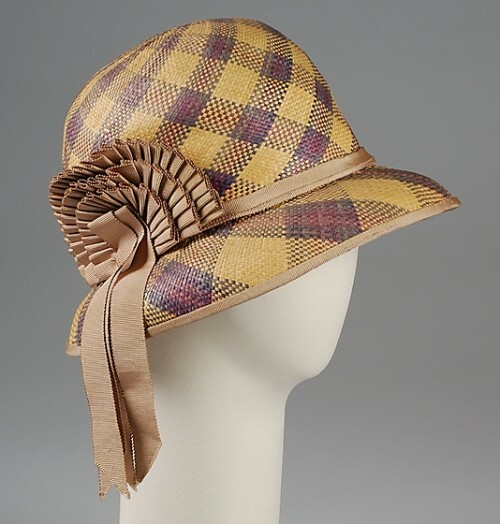 In the 1920s, pleated and manipulated ribbons had another moment under the spotlight of fashion as ribbon pleated and folded into sunbursts and stars shone out from the sides of cloche hats. Cockades or trimmings were made at home, as well as by professional milliners. A hat could be updated and transformed with a bit of ingenuity and ribbon. I bought the vintage hat below a few years ago and was intrigued by the folded trim. It took a few goes to figure it out and quite a few more goes for the technique to stick in my head – it is not at all simple, but I figured it out using weave lines in in the grosgrain ribbon as my guide. My version of the technique is in my book Fabric Manipulation, called Arrowhead folds. I used this technique to create the necklace below. My book has lots of other ribbon folding techniques, many of them inspired by Indian ribbon work using real metal ribbon, known as Gota. 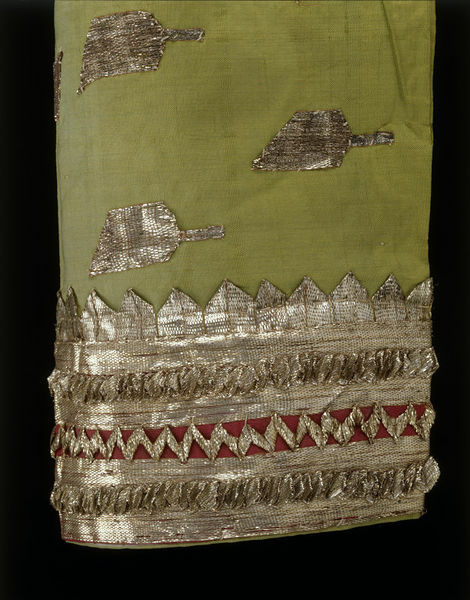 Gota work was traditionally used to decorate luxurious costumes and clothing in the 19th century alongside fine silks and metal thread embroidery. The pure metal wefts of the ribbon allow it to be folded precisely to create intricate 3D folds and twists, and the ribbon could also be embossed for added effects. Nowadays, most gota work is done in inferior plastic ribbon which has neither the sheen, weight or crispness of the metal ribbon, but still looks pretty gorgeous. I’ve seen real vintage Gota ribbon for sale at Cloth House, my favourite fabric shop in London. I found a nice piece in a ribbon stash at the school I worked in yesterday; the widely-spaced folded-back zigzag ribbon fold detail was new to me – I am working on samples using different types of ribbon for different effects. The pointed Vs along top and bottom are one of the gota techniques I figured out a while back and it is included in my book. I taught my favourite box-pleating technique to the students at Chateau Dumas earlier this month, using French vintage striped ribbon. The day after the workshop, the students visited the local hat-making museum and decorated their hats with pleated French ribbon. What could be more more perfect? You can find more ribbon work and related ideas in my Pinterest boards on Fabric Manipulation, particularly the pleating board and the appliqué board. One day I’ll have time to try them all out – in the mean time, please post links to any other interesting ribbon resources and if you have tried any of the techniques, please share them. 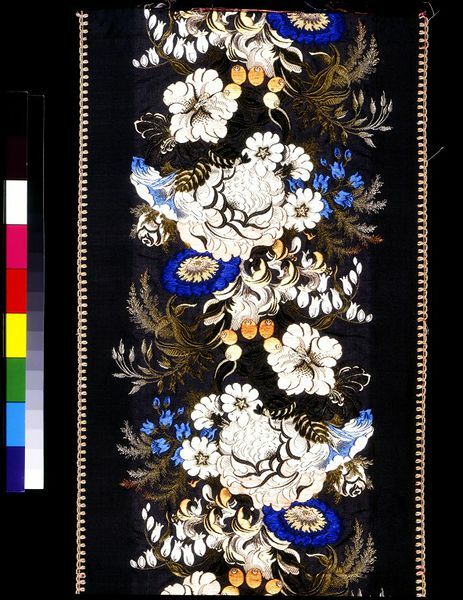 A shorter version of this post originally appeared on Mr X Stitch as one of my monthly textile history Pinning the Past columns. Explore the other columns here. I’ve long been fascinated by Bethany’s combination of textiles and cement; the contrasting soft and hard materials, the transformation of cloth from malleable to solid objects and the potential her innovative techniques would hold for my kind of manipulated textiles. Last year I applied to a-n’s collaboration bursary to fund our travel and expenses to develop a collaboration and we started working together in January 2014. Our aim is to create work suitable for public art commissions, large-scale installations and projects. I wanted to explore Bethany’s techniques and she wanted to look at more organic forms, moving away from her usual square-format. We started by simply setting a whole series of my textile and paper samples into cement to see how they worked and then moved on to making specific samples to test based on what worked best and looked most interesting. Plenty was simply scrapped as uninteresting, or not sufficiently exciting to stand out. I wanted to make sure what I made was sufficiently different to Bethany’s existing work too. A new set of samples worked much better and gave us new avenues to explore. At this stage I was struggling to find a theme which worked for me, beyond simply exploring interesting shapes. Our discussions lead to the idea of growth and renewal and eventually to mould, lichen, moss and fungus. We also worked on colour palettes; looking for something that contrasted well with the grey of the cement but would also work with my quite subtle-coloured work. 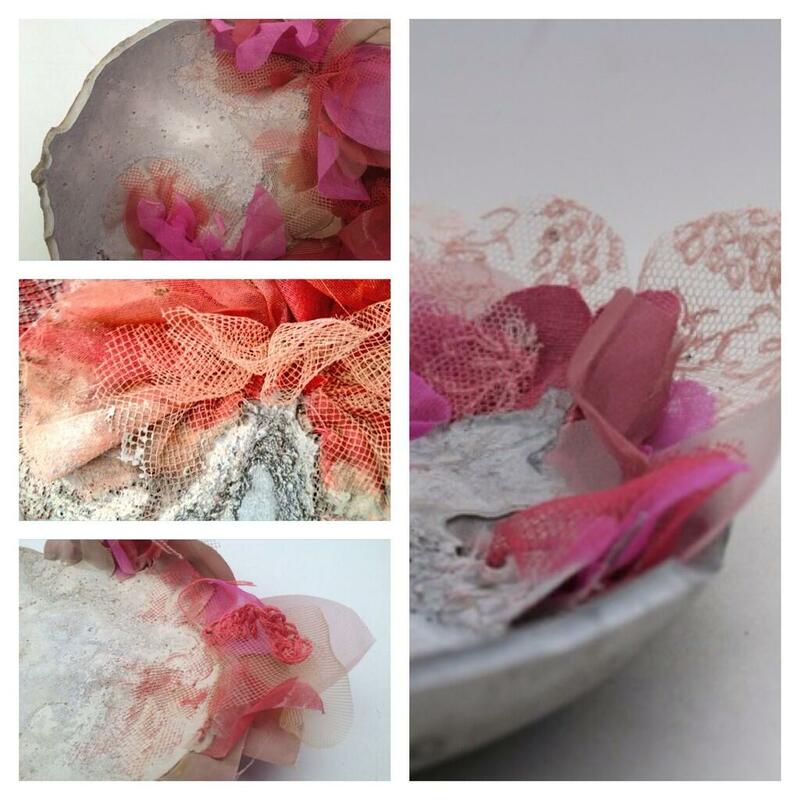 We used Pinterest to share ideas, much like I did with my collaboration with Alys Power. Our palette became delicate pink. Bethany continued to work on new shapes and forms while I experimented with fungus-inspired growths made in textile using fabrics I dyed with elderberry. Their success was limited but other pieces definitely worked and we have finally hit upon the perfect combination of form, textile structure, colour-palette, type of fabric and display concept which we are really happy with. The finished work is a series of smaller pieces; potentially a lot of small pieces, so we are busy making more and more. Our aim is to exhibit the work in 2015 and use it as a basis for joint application for projects and commissions.